Police will monitor traffic in Paris on Monday after pollution levels prompted the French government to impose major restrictions. Only motorists whose cars have odd-numbered registration plates will be allowed to drive. On Tuesday, if the restrictions remain in place, it will be the turn of those with even-numbered plates. 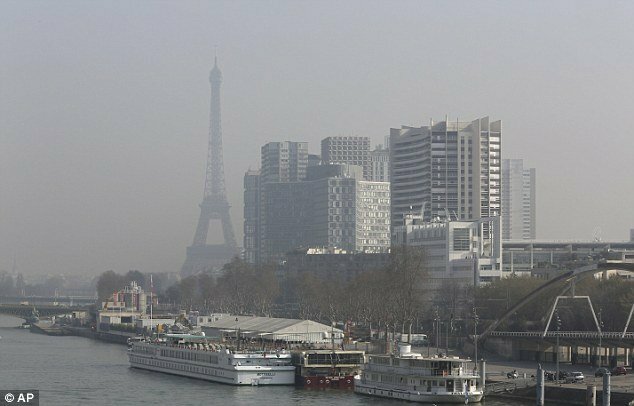 Ministers acted after air pollution exceeded safe levels for five days running in Paris and surrounding areas. The measure has been tried once before, in 1997. Paris air quality monitoring body Airparif says it had a noticeable impact on improving air quality, although critics have disputed its findings. Motorcycles will also be covered by the ban, which runs from 05:30 local time to midnight on Monday. There are exceptions for electric and hybrid vehicles, and for cars carrying three or more passengers. Those flouting the restrictions will face a small fine although there will be free parking for those with number-plates ending in an even number. Delivery companies are already complaining of lost income. Politically the stakes are high, with elections for Paris mayor due to start next week. Opposition leader Jean-Francois Cope complained that the ban “lacks coherence, explanation and on the ground it’s really panic”. On Friday, public transport was made free of charge for three days in an attempt to encourage people to leave their cars at home. This measure will continue on Monday. The capital’s air quality has been one of the worst on record, French environmental agencies say, rivaling the Chinese capital, Beijing, one of the world’s most polluted cities. On Friday, pollution levels hit 180 microgrammes of PM10 particulates per cubic metre, more than double the safe limit of 80. PM10 particulates are emitted by vehicles, heating systems and heavy industry. Pollution levels were said to have fallen on Sunday but were expected to rise again on Monday. The government is to review pollution levels again, before deciding whether to extend the driving restrictions for longer. Officials say one heavy rainfall would have more effect than a one-day ban.